2017年 Pierre-Yves Caër Gallery, 巴黎. 2016年 Art Basel Hong Kong (Vanguard 画廊), 香港. 2012年 Vanguard 画廊, 中国 上海. 2011年 法国涅普斯摄影博物馆(Musée Nicéphore Niépce), 法国. 2010年 东京都摄影美术馆(The Tokyo Metropolitan Museum of Photography), 日本 东京. 首尔摄影美术馆(The Museum of Photography, Seoul), 韩国 首尔. 2008年 Nei Liicht艺术中心(Centre d’art Nei Liicht), 卢森堡 杜德兰格. 2007年 莱克图尔摄影艺术中心(Centre de Photographie de Lectoure), 法国. 琴山画廊(Keumsan Gallery), 黑里艺术区(Heyri Art Valley), 韩国. Prix Niépce 2006, Quinzaine Photographique Nantaise 媒体艺术, 法国 南特. Images du pole, 法国 奥尔良. Chambre avec Vues, 法国 巴黎. 2005年 国立国际美术馆(National Museum of Art , Osaka), 日本 大阪. Van Zoetendaal Collections, 荷兰 阿姆斯特丹. 2004年 “水银”, 当代美术馆, 德国 柏林. 2003年 “易装”, 中京大学艺廊, 日本 名古屋. 2002年 “密制珍珠“, “望窗外”, RX画廊, 法国 巴黎. “易装”, 时代画廊(Zeit-Foto Salon), 日本 东京. “蜜蜂－镜子”, il Tempo画廊, 日本 东京. 2001年 “密制珍珠”, 时代画廊(Zeit-Foto Salon), 日本 东京. “望窗外”, il Tempo画廊, 日本 东京. 2000年 国立大剧院美术馆(Galerie du Théâtre Granit), 法国 贝尔福. 1999年 群马县立近代美术馆(The Museum of Modern Art , Gunma), 日本 群马县. “C.V.N.I.”, il Tempo画廊, 日本 东京. “P.N.I.”, 时代画廊(Zeit-Foto Salon), 日本 东京. 1998年 il Tempo画廊, 日本 东京. 1997年 “三部作”展, /DOWN Laage-Salomon 画廊, 法国 巴黎. “旧衣服肖像”, 国立大剧院美术馆(Galerie du Théâtre Granit), 法国 贝尔福. 1996年 “旧衣服肖像”, 国立大剧院美术馆(Galerie du Théâtre Granit), 法国 贝尔福. 1995年 “DOWN / 液体与玻璃”, 时代画廊(Zeit-Foto Salon), 日本 东京. “DOWN / 旧衣服肖像”, Chimera画廊, 日本 东京. “DOWN / 鸟”, Aki-Ex画廊, 日本 东京. 1993年 “白与空间”, Hosomi画廊, 日本 东京. 2018年 “Incognito : Eye in Search”, Singapore International Photography Festival, Japan Creative Centre, 新加坡. “A beautiful moment / Japanese Photography”, Huis Marseille 摄影美术馆, 阿姆斯特丹，荷兰. “The Myriad Forms of Visual Art :196 Works with 19 Themes”, 国立国际美术馆, 日本 大阪. “Come Back! Retour à la Photo”, Galerie de l’Etrave- Espace d’art Contemporain, Thonon-les-Bains, 法国. “Paris c’est Elles”, La Boîte 31 de Marie-Ange Guilleminot, 巴黎. “Tan /110th Anniversary : Memorial Exhibition”, Art Gallery of Takashimaya, 东京. 2017年 “Rodin, Muybridge and Yuki Onodera”, Shizuoka Prefectural Museum of Art, 静冈县立美术馆, 日本. “Communication and Solitude”, Tokyo Photographic Art Museum, 东京都摄影美术馆，日本，东京. “Re: Collection II”, Aichi Prefectural Museum of Art, Nagoya, 爱知县美术馆，日本. “Forms of Light /Scenes of Light”, Hiroshima City Museum of Contemporary Art, 广岛市现代美术馆，日本. “From the Terada collection 058 Black & White: Colours”, Tokyo Opera City Art Gallery, 日本 东京. 2016年 “L’Œil de l’Expert”, Musée Nicéphore Niépce, Chalon-sur-Saône, 法国. “Eyes of Six Women”, Zeit-Foto Salon, 东京. “Ecce Homo : The Human Images in Contemporary Art”, The National Museum of Art, Osaka, 日本. and Tokyo Metropolitan Teien Art Museum, 日本. 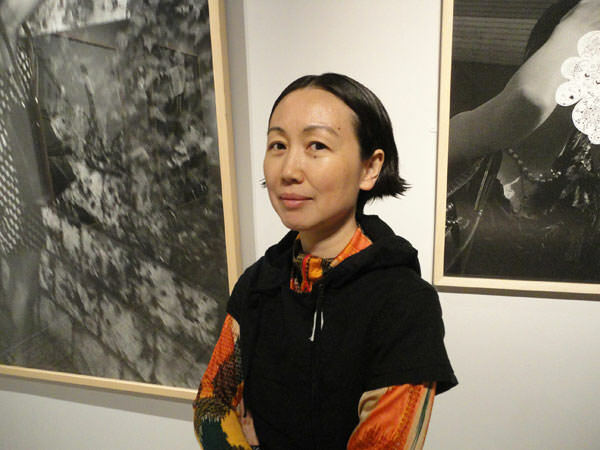 “Japanese Photography from Postwar to Now”, 旧金山现代艺术博物馆(SFMOMA) 圣弗朗西斯科 美国. “L’œil du collectionneur”, 斯特拉斯堡現代藝術博物館 (MAMCS), 斯特拉斯堡, 法国. “Le Bal / Hommage à Etsuro Ishihara”, Zeit-Foto Salon, 东京. 2015年 “The Younger Generation: Contemporary Japanese Photography”, The J.Paul Getty Museum, Los Angeles. “La lucidité des utopies”, Chateau de Lunéville, Lorraine, 法国. “40th Anniversary of the Kimura Ihei Award”, Kawasaki City Museum, 日本. “Impact of Photograhy : collection of Higashikawa”, Asahikawa Museum of Art, Hokkaido, 日本. “Photographer’s eyes /Printmaker’s eyes, Six anthologies”, Shizuoka Prefectural Museum of Art, Shizuoka, 日本. “Dessin”, 时代画廊(Zeit-Foto Salon), 日本 东京. “Between Ceramics and Light”, Takashimaya X Gallery, Tokyo, Osaka, Kyoko, Yokohama, 日本. 2014年 “Elles Allument”, Art’Course画廊，法国 斯特拉斯堡. “Photographs by five”, 时代画廊(Zeit-Foto Salon), 日本 东京. “Silent Light”, 高岛屋X画廊(Takashimaya X Gallery), 日本 东京. “Dancing Light” Huis Marseille 摄影博物馆，阿姆斯特丹. 2013年 “窗边：摄影师的视角”，The J. Paul Getty 博物馆, 美国 洛杉矶. “摄影的美学标准——五元素 ”，东京摄影博物馆(The Tokyo Metropolitan Museum of Photography), 日本 东京. “第35周年收藏展”,国立国际美术馆(National Museum of Art , Osaka)，日本 大阪. “百花齐放/女性情景”,横须贺美术馆(Yokosuka Museum of Art)，日本 横须贺. 2011年 “从未在一条河中”, Maison d’art Bernard Anthonioz艺术中心，法国 诺让. “l’apparition”,la Gare Saint Sauveur de Lille艺术中心, 法国 里尔. “The child within un / from the collection”, 东京摄影美术馆, 日本 东京. 2010年 “第八届上海双年展–巡回排演”, 上海美术馆, 中国 上海. “今日摄影”, 群马县立近代美术馆(The Museum of Modern Art , Gunma), 日本 群马县. “涅普斯大奖回顾展”,Mois de la Photo, 蒙帕纳斯博物馆(Musée du Monparnasse), 法国 巴黎. “木村伊兵卫奖35周年纪念”, 川崎市博物馆(Kawasaki City Museum), 日本 川崎. “布鲁博物馆日本周”,Musée de Brou美术馆 法国 布尔格恩布莱斯. “Beyond the Border 中日当代艺术家交流展”, 7艺术中心 中国上海. “So+Zo远动”, 文化村博物馆(The Museum of Bonkamura), 日本 东京. 2009年 “Elles@centrepompidou” 蓬皮杜艺术中心(Centre Pompidou), 法国 巴黎. “Paysges de la Conscience国际摄影双年展”, Museo de Arte Moderno de Bogotá, 哥伦比亚. “Ce qui est à voir est ce que vous voyez”, Rencontres d’Arles摄影节, 法国 阿尔勒. “Indizien”, Baer画廊, 艺术之家, 德国 德累斯顿. “从来没有迟到更好”, 伊丽莎白艺术基金会(Elizabeth Foundation), 美国 纽约. “日本会见中国”, 枥木县立美术馆(Tochigi Prefectural Museum of Fine Arts), 日本 宇都宫市. “面对多面” organized by CulturesFrance, 当代艺术国家博物馆, 希腊 萨罗尼加. “Booth 67f”, Van Zoetendaal收藏, 荷兰 阿姆斯特丹. “仁川艺术平台开幕展”, 仁川艺术平台(Incheon Art Platform), 韩国 仁川. 2008年 “收藏3/肖像的特征”, 国立国际美术馆(National Museum of Art , Osaka), 日本 大阪. “Indefinite Beauty”, White Factory, 中国 上海. “Verticals”, Van Zoetendaal收藏, 荷兰 阿姆斯特丹. “面对多面” organized by CulturesFrance, la Silom画廊, 泰国 曼谷. “艺术与城市的历史–巴黎、纽约、东京、上海”, 仙台媒体艺术中心(Sendai Mediatheque), 日本 仙台. “Chasseurs de beauté”, 21画廊, 日本 东京. “世界的7种图景”, Gallery Touchart, 黑里艺术村(Heyri Art Valley), 韩国. 2007年 “镜头里的日本：日本摄影艺术作品展”, 上海美术馆, 中国 上海. “摄影: 非油画”, 法国涅普斯摄影博物馆(Musée Nicéphore Niépce), 法国. “面对多面” organized by CulturesFrance, 阿克雷里美术馆, 雷克雅未克, 冰岛. “日本当代艺术节”, 黑里艺术村(Heyri Art Valley), 韩国. “Die Liebe zum Licht”, 波鸿美术馆(Museum Bochum), 德国 波鸿. “世界的巴黎, 1900-2005巴黎外国艺术家联展/蓬皮杜收藏中心”, 国立新美术馆, 日本 东京. “思想修辞”, 芝加哥文化中心(Chicago Cultural Center), 美国 芝加哥. “冬”, RX 画廊, 法国 巴黎. 2006年 “现代生活中的油画家”, 蓬皮杜中心(Centre Pompidou), 法国 巴黎. “Die Liebe zum Licht”, 策勒艺术博物馆(Kunstmuseum Celle), 德国 策勒. “非常平常”, 图片中心(Centre de la Imagen), 墨西哥. “收藏4”, 群马县立近代美术馆(The Museum of Modern Art , Gunma), 日本 群马. “Die Liebe zum Licht”, Städtische 画廊, 德国 代尔曼霍斯特. “思想修辞”, McDonough美术馆(McDonough Museum of Art, Youngstown), 美国 俄亥俄州 杨斯顿. “与光对视”, Carl Solway画廊, 美国 俄亥俄州 辛辛那提. “面对多面”, AFAA主办, 爱丁堡市艺术中心, 英国 爱丁堡. “Taille Humaine”, Sénat et Orangerie su Luxembourg, 法国 巴黎. 2005年 “活着”, 当代美术馆, 日本 东京. “非常平常”, Sala de arte y cultura de Caja Canaria de la Laguna, 西班牙 加那利群岛. “非常平常”, Centre Culturel “Les Chiroux”/ Institut Lambert Lombart, 比利时 列日. “一面对多面”, organized by CulturesFrance, Artcurial, 法国 巴黎. “The Children’s hour”, 新艺术博物馆(Museum of New Art, Pontiac), 美国 密西根. “非常平常”, 日本驻罗马文化协会(The Japan Cultural Institute in Rome), 意大利. “非常平常”,艺术馆(Museum fuer Ostasiatische Kunst), 德国 柏林. “思想修辞：当代艺术中的凝集力”, 迪堡大学Richard E. Peeler艺术中心, 美国 印第安纳绿堡. “精华” RX 画廊, 法国 巴黎. 2004年 “Roppongi Crossing-日本当代艺术2004新视野”, 森美术馆(Mori Art Museum),日本 东京. “非常平常”, 日本驻克隆文化协会ª The Japan Cultural Institute in Cologne), 德国. “Apparemment leger”, Nei Liicht艺术中心(Centre d’art Nei Liicht), 卢森堡. “非常平常”, 亚洲建筑总会(Casa Asia Headquaters), 西班牙 巴塞罗那. 2003年 “木村伊兵卫摄影奖”, 美能达摄影艺术空间, 日本 东京,大阪. “Aura”, RX 画廊, 法国 巴黎. “摄影新宇宙”, 海岸通画廊CASO, 日本 大阪, 文化艺术集中地, 日本 仙台. 2002年 “幻想”, 隆德艺术馆(Lunds Konsthall), 瑞典 隆德. “幻想”, Museet for Fotokunst, Brandts klaedefabrik, 丹麦 奥登塞. “幻想”, 延雪平县博物馆(The County Museum of Jonkoping), 瑞典 延雪平. “幻想”, 芬兰摄影博物馆(The Finnish Museum of Photography), 芬兰 赫尔辛基. “日本当代摄影艺术展”, 拉脱维亚摄影美术馆(Latvian Museum of Photography), 立陶宛 里加. “RX画廊开幕展”, RX 画廊, 法国 巴黎. “建筑与人/欧洲摄影周”, Nei Licht艺术中心(Centre d’art Nei Liicht), 卢森堡 杜德兰格. “日本摄影协会奖”, 富士摄影沙龙(Fuji Photo Salon), 日本 东京. “摄影新宇宙”, 东京摄影博物馆(The Tokyo Metropolitan Museum of Photography), 日本 东京. 2001年 “幻想”瑞典及其他北欧巡回展, 斯德哥尔摩文化中心, 瑞典 斯德哥尔摩. “Off Triennale-Zeit-Foto”, Ryunichi Kantonn Kaikan, 日本 横滨. 2000年 “日本当代艺术摄影展”, Hallescher Kunstverein, 德国 哈勒. “日本当代艺术摄影展”, 波鸿美术馆(Museum Bochum), 德国 波鸿. “日本当代艺术摄影展”, Badischer Kunstverein Karlsruhe, 德国 卡尔斯鲁厄. “Mois de l’Image”, Plastiques Albert Chanot艺术中心, 法国 克拉玛. “日本当代艺术摄影展”, NBK (Neüer Berliner Kunstverein), 德国 柏林. “不完整的历史” 休斯顿摄影艺术中心（Houston Center for Photography美国 休斯顿. “关于离家”, 当代艺术中心（Centre d’art Contemporain, Saint-Priést）, 法国 圣普列斯特. 1998年 “98摄影双年展”, 媒体艺术中心-TV 画廊, 俄罗斯 莫斯科. “Medialogue”, 东京摄影美术馆(The Tokyo Metropolitan Museum of Photography), 日本 东京. “样式的游戏”, Espace Electra, 法国 巴黎. “不完整的历史/1864-1997来自日本的女性摄影艺术家”, 罗彻斯特视觉研究讲习所(Visual Studies Workshop), 美国 罗彻斯特. “给予的与虚构的”, 国立摄影中心(Centre National de la Photographie), 法国 巴黎. “馆藏叙述性艺术作品展”,枥木县立美术馆(Tochigi Prefectural Museum of Fine Arts),日本 宇都宫. “水、空气和土地之间”, Vrais Rêves 画廊, 法国 里昂. “Zeit-Foto 21周年”, Shimida艺术空间, 日本 东京. 1997年 “艺术史中浮动的女性肖像”,枥木县立美术馆(Tochigi Prefectural Museum of Fine Arts),日本 宇都宫. “东京第二届国际摄影双年展”,东京摄影美术馆(The Tokyo Metropolitan Museum of Photography), 日本 东京. 1996年 “Sosie”, 佐贺町展览馆(Sagacho Exhibit Space), 日本 东京. “第二十一届柯达批评摄影奖展”, Passage de Retz 画廊, 法国 巴黎. “Premier Salon des Artistes Naturalistes”, 巴黎摄影月, 国家自然历史博物馆, 法国 巴黎. “鸟”展, 皮埃尔-布鲁南画廊(Galerie Pierre Brullé), 法国 巴黎. 1993年 “日本先锋摄影艺术家作品展”, Seihin文化中心, 中国台湾 台北. 1992年 “第一届新宇宙摄影展”, P-3艺术与环境画廊, 日本 东京.